"De-risking" refers to foreign financial institutions closing the accounts of clients perceived as high risk for money laundering or terrorist financing abuse. These clients include money service businesses, (e.g. Money Gram, Western Union) nonprofit organizations, correspondent banks, and foreign embassies. 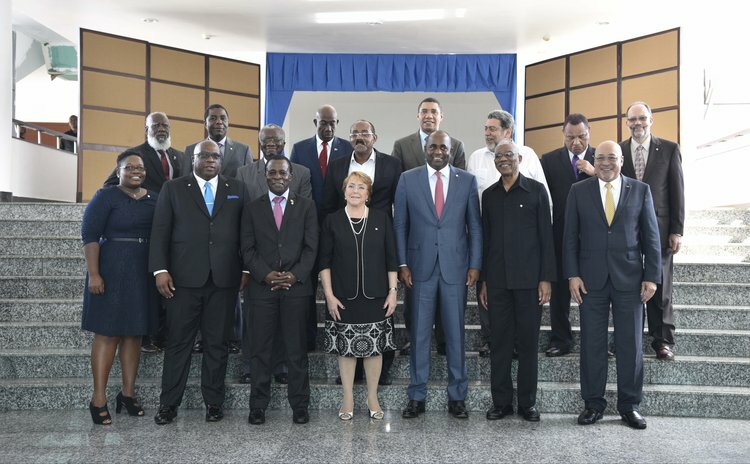 At the 37th regular meeting of the CARICOM heads of government held in Guyana from July 4 – 6, 2016, the matter of foreign correspondent bank de-risking was discussed and follow-up action to address the negative effects of de-risking was broadly, if not vaguely identified. The heads agreed that CARICOM would continue its "robust and unrelenting advocacy on the issues" and that the Committee of Ministers of Finance on Correspondent Banking (the Committee) would maintain the current high level engagement. This broad statement about the agreed follow-up action begs for the specifics on the issues previously addressed by the Committee; on the parties which the Committee has engaged and; on the empirical data used to support the Committee members' robust and unrelenting advocacy of the issues. In the absence of any specifics, this commentary asks two questions about the issues that the Committee might have already addressed and the supporting data it might have used during its advocacy. The first question is, has the Committee argued that the foreign bank's de-risking of indigenous or other banks in the region could contribute to increased systemic vulnerability in the financial sector by pushing the indigenous banks to smaller foreign institutions lacking adequate AML and internal control programs? Instead of having a direct account relationship with a large safe and sound foreign bank, a de-risked indigenous bank might establish a sub-account relationship with say a medium-sized bank with branches in the region. The medium-sized bank, perhaps due to its size and risk-profile, has not been de-risked and consequently has continued to maintain a correspondent account relationship with a foreign bank. The de-risked indigenous bank would clear its foreign currency transactions through that selected regional bank or would "nest" or conduct all its foreign payments or receipts through its sub-account at this medium-sized regional bank. A nesting arrangement would make the indigenous bank less competitive by increasing banking costs paid by the bank's customers. In addition, the nesting or sub-account arrangement would normally be prohibited by the regulatory agencies in most foreign countries – resulting in an upward adjustment in the medium sized bank's risk profile (e.g. from say a moderate-risk profile to a high-risk profile) and the eventual de-risking of that bank because of the change its risk profile. Another example is the case of a de-risked indigenous bank using a credit union or a savings bank located in a foreign country to clear its customers' debit/credit card foreign currency transactions. Normally, credit unions or savings banks do not offer foreign correspondent services and would not be expected have the type of AML program sufficiently adequate to meet the enhanced due diligence and internal controls requirements applicable to a foreign financial institution customer. Based on the two examples above the central banks in the region (e.g. ECCB) would need to (a) provide the Committee data on what measures have the de-risked indigenous banks implemented to maintain their ability to provide foreign currency services to their customers, and (b) quantify the systemic risk associated with any such measures. The second question is, in its advocacy has the Committee demonstrated its awareness that the goals of AML policies and procedures (AML program) were not inherently in conflict (See "Understanding Bank De-risking," http://www.globalcenter.org) and that, in the implementation of this program, tensions are expected to emerge? Surely, risk management becomes problematic in an environment when AML measures and non-compliance penalties are overtly excessive as reflected in the scope and intensity of the products, services, customers and geographical locations de-risking program implemented by the foreign banks. For example; excessively restrictive AML measures by foreign banks offering correspondent banking account services to Caribbean and other indigenous banks, and the expectation of excessively high money penalties imposed by the regulatory agency on the foreign banks offering these correspondent banking services, would affect access to these services and could have serious humanitarian consequences. Many companies in the money services (MSBs) have been de-banked or have no clear expectations and are unable to anticipate or protect themselves against impending account closures. Money Service Business (MSBs) specialize in the migrant remittances, foreign exchange, money order sales, and etc. businesses and tend to be small entities offering services to specific geographic locations and customer base. The migrant remittance business is the life blood of the MSBs and migrant remittances serve important funding sources for the Latin America and Caribbean economies. In 2015, migrant remittances to Jamaica amounted to US$2.217 Billion, 16.8% of GDP; to Guyana US$317 Million, 10.6% of GDP; and to Haiti US$2.198 Billion, 22.7% of GDP. For Latin America and the Caribbean total remittances amounted to US$ 68.313 Billion. As far back as October 2006, the U.S. Federal Reserve devised a program to extend banking services to undocumented immigrants. This new remittance program aimed at bringing Mexican migrants who sent money home into the mainstream U.S. financial system, regardless of their immigration status. The Fed did recognize that migrant remittances provided not only an important source of funds for the Latin America and Caribbean economies, but also, if concentrated in a few US banks, these remittances could significantly increase these US banks' profitability (e.g. through remittance and foreign exchange fees) and short-term liquidity. Perhaps, the Committee has already been receiving from the central banks, in the region, (a) updated migrant remittances data in absolute terms and relative to the countries' economies or GDP; and (b) information on any effort to restrict the activities of MSB's providing remittances services to migrants remitting funds to their families and other dependents home. In summary, the formulation and implementation of a robust and unrelenting advocacy approach to address the current de-risking issues would require Committee members and support staff to have: (a) a more than an ordinary understanding of AML risk management policies, procedures and practices by the foreign banks de-risking their correspondent banking services to the indigenous banks; and (b) readily available empirical data, and assessment reports on specific de-risking issues as identified by the Committee. Additionally, the Committee members and central bank governors might have already decided to cooperate and coordinate more fully for the purpose of developing streamlined definitions, standards and policies that enhance AML compliance programs in the region and improve suspicious transactions reporting, and management accountability. Committee members might have reminded the foreign banks that de-risking has a public repercussion, since these banks are cutting off crucial funds to vulnerable population segments dependent on remittance flows from abroad. Finally, it is highly improbable that the currently de-risked high-risk, low profitability and low volume indigenous banks would not regain their foreign correspondent relationship. To continue offering banking services in their respect jurisdictions, such banks might have to convert to branches of a reorganized and well managed indigenous bank. Formulating and successfully implementing an appropriate de-risking response is truly for the technically competent professionals in the central banks and ministries of finance in the CARICOM countries.